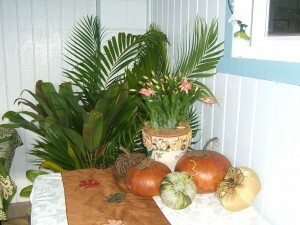 Lots going on here in Aloha-land as Fall turns into Christmas and Holiday time. A newsletter will be coming your way soon with all the Christmas e-book specials I have going in in both of my incarnations…as the cozy/funny mystery writer and as my alter ego Jill Marie Landis. 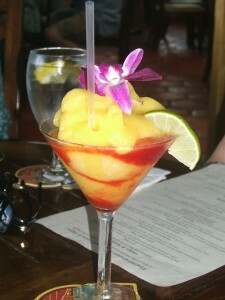 We celebrated MAI TAI ONE ON with an autograph party at the Tahiti Nui Bar and Restaurant in Hanalei at the end of October. 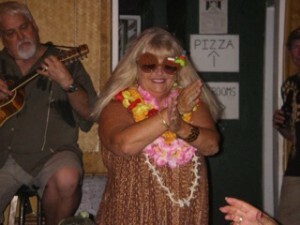 My hula sisters, Bev and Pat Kauanui, The Pono Kane Trio, the Ukulele class and half the town partied until not one book was left. The unshakable Robin Savage of Robin Savage Gifts (where you can find copies of the book in Hanalei) remained calm and took orders for more. A good time was had by all, especially me! We celebrated Thanksgiving with neighbors in the “hood” as we call our enclave of hip oldsters. Everywhere you look there is bounty and greenery. I can’t believe it’s time for the Holidays. Christmas is almost here and the town is starting to take on a festive glow. Nothing compared to the mainland but there are holiday reminders scattered around the local Ching Young shopping center and Hanalei town. 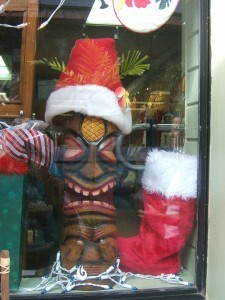 How Much is That Tiki In the Window? There’s no snow but even Santa has made an appearance between the tiki torches in front of a local restaurant on the corner of Aku Road and the Highway. Be sure to check out my facebook for latest news of special sales on e-books. Mahalo to all of you for your support. 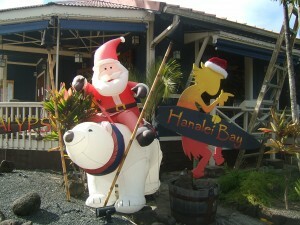 Wishing you all a Mele Ka-Tiki-Maka, Merry Christmas and a Happy New Year!